I honestly can’t count the number of times I’ve watched something unfold on Elementary and wondered how Joan felt about it all. 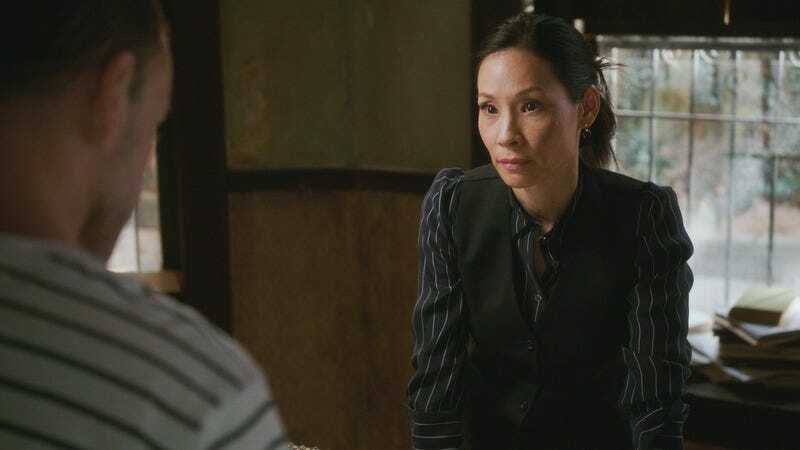 Lucy Liu is very much at home in the role, but as the narrative POV has increasingly defaulted to Sherlock, she’s often on the outside of big moments looking in. Sometimes these make sense: Sherlock speaking about issues related to his recovery, for example, are very effective when played as him being unsure of his welcome, even after such a long partnership. (It’s always an unspoken reminder of the loneliness that drove Sherlock into his downward spiral to begin with.) But he’s become the default to such an extent that he often soaks up the POV on things that are ostensibly about Joan. We’ve gotten so used to Joan silently absorbing a Sherlock monologue that it can make even moments of real emotion—like last episode, when she got so visibly uncomfortable with Sherlock’s pressure to denounce Shinwell that she got up and left the room under a thin pretense—feel a little opaque. Of course, something else that goes unspoken amid all this is the inescapable subtext that with a few days of dedicated work, Joan and Sherlock have already managed to rumble those upper echelons to the point of discovering the mastermind behind it all. Even given the rigors of a 24-episode season that required recurring characters to build a season-long back-burner arc, and the fact that Shinwell arrived palpably pre-doomed, this episode casts a bleak shadow across all that in retrospect. There’s something quietly awful about realizing how much Joan and Sherlock could actually have helped Shinwell crack the case that cost him his life, if they had tried earlier. His need didn’t motivate them nearly as much as his death did. And the mechanics of their discoveries are fairly interesting—certainly interesting enough to remind us how much character beats matter in the middle of a case. But in general, if a show is determined to build everyone’s increased emotional stakes atop the murder of a black man whose redemption arc was thus cut short, I honestly can’t think of a more awkward way to handle all of that to have the red herring be a black man described as “a thug and a cokehead” (and who fulfills that stereotype right down to the tasteless décor), and then slowly tease out that the real villain is upwardly-mobile black man Wilcox. Taken together, I can’t say I’m particularly excited about any of the ways this procedural aspect might play out. The character stuff, as usual, asks for benefit of the doubt. Sherlock’s obsessive distraction seems tied to a sense of unfinished business with Shinwell. (Jonny Lee Miller’s monologue at the meeting was very effective, ostensibly sympathetic to Shinwell but brimming with guilt and resentment that he wasn’t quite able to articulate.) And while there’s no denying Joan’s sudden lurch into the narrative driver’s seat is predicated on Shinwell’s murder, I’m at the point of taking whatever of her POV I can get. She’s finally on the verge of going Full Vigilante, which would be a fascinating, even destructive, move from her. I don’t know what she’s thinking about her chances—but for once, she might tell us. “You wanted to see me?” I’m not saying May is Sherlock’s hallucination of his mother sent to Fight Club him and throw a monkey wrench in our assessment of Sherlock’s well-being. What I am saying is I haven’t even bothered to worry about alternative explanations, because after the last few seasons I have absolutely zero trouble believing they would bring an imaginary woman back from the dead merely to give Sherlock another family member to be miserable about. A small beat that takes on new weight in the wake of this episode if May is, in fact, imaginary mom material: The security-camera-elevation shot of Sherlock painstakingly scoping out the brownstone when they get back from the scene of Shinwell’s murder. It reads easily as his heightened concern for Joan’s safety in the wake of this violence, but it could just as easily be Sherlock trying to make sure May isn’t eavesdropping where he doesn’t want her. And the camera’s remove only reinforces the sense of someone else watching. Director Christine Moore also puts Joan in the power position in a lot of crucial shots; she stares down at Folsom, she props herself on the kitchen table while she explains the lay of the land to a quite undone Sherlock, and when she tries to manipulate Tall Boy she gets that interrogation room all to herself. “In many respects he just didn’t try hard enough.” I recognize that Sherlock is speaking as the victim of a beating, and that at this point he’s projecting harder onto Shinwell than the Disney nighttime laser show onto the side of Cinderella’s Castle. But given that default POV, and the fact that nothing in the narrative has ever bothered to check similar observations when he’s made them, it just feels like another attempt to make us feel that Shinwell was a tragic character with fatal flaws instead of someone who risked (and lost!) his life trying to bring down an incredibly dangerous crime ring single-handed. “You all right?” The second time this season alone that Gregson has checked on Joan! Amazing Precinct-Dad work. Joan’s black-on-black-on-black suit this episode (worn for so long Sherlock comments on it), splitting the difference between John Wick and Hell’s actuary.